black&write! is a national project and the first of its kind in Australia. It was developed to foster a significant Indigenous writing community. Launched by author Boori Monty Pryor and actor Ernie Dingo at the 2010 Cairns Indigenous Arts Fair, it is a bold, inspiring project designed to nurture talent, flex the creative imagination and change the landscape of Indigenous writing in Australia. While Australia is active in supporting its Indigenous athletes, artists and dancers, there is a recognised lack of long-term strategies to encourage and develop its Indigenous writing talent. This imbalance is recognised in many recent writing and publishing surveys and government-funded research studies. black&write! is made up of the Indigenous writing fellowships and the Indigenous editing mentorships. The project is designed to recruit, train and mentor Aboriginal and Torres Strait Islander editors to develop Indigenous authored manuscripts. In 2012 and 2013, black&write! also offers training in onscreen editing for Aboriginal and Torres Strait Islander peoples through the Indigenous Onscreen Trainee Editor program. encourage lifelong Indigenous learning and literacy and foster a love of reading, writing and ideas in Aboriginal and Torres Strait Islander communities. Well, if Calypso Summer is anything to go by, this project will be a resounding success. 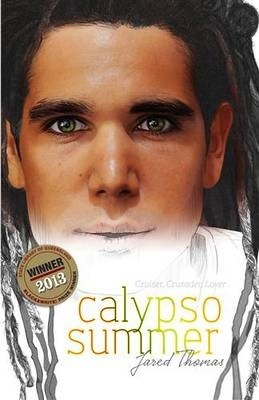 I really enjoyed this book, and I think its engaging character Calypso will appeal to many young people, indigenous or not. Calypso is not long out of school, living in the beachside suburb of Henley Beach and finding it hard to get work. He wants to work in a sports store, but youth unemployment is high, and although he did well at school it’s not hard to work out why he’s one of the first to be eliminated. He’s a young Nukunu man, and because he’s crazy about cricket, he’s adopted a Rasta persona. Not every employer likes dreadlocks, but it’s obvious that it’s not his hair that’s the problem. Even dressed up flash, those bosses looked at me like I was going to rob their shop. Who could blame him for getting discouraged? He takes up ganja (cannabis) and spends his days listening to reggae and hanging out at the beach. But fortune smiles on him at last when he’s offered work experience in a DVD store, and is trusted to look after the shop on his own. While payment is irregular, it’s better than the humiliation of Centrelink, and he’s able to rent his own flat. When the owner of the store, a whitefella called Gary decides to sell health products instead of DVDs, Calypso is asked to find out from his mob if there are any indigenous products that could be added to the range. The problem is that Calypso is a city boy and knows nothing about his indigenous heritage or his people. And so begins Calypso’s journey towards identity and belonging, but there is no sentimentalising. Calypso’s narration is strong and authentic, an engaging mix of self-doubt and adolescent confidence. His family in coastal Port Germain make him welcome, but he still has to convince them that Gary’s proposal isn’t a rip-off, because they’ve learned to be wary. Back home he also has to deal with a cousin called Run who’s a liability in more ways than one, especially when he puts at risk Calypso’s emerging relationship with a girl called Clare. She’s a Ngadjuri girl, and she’s as crazy about cricket as Calypso is, but her family doesn’t want her getting mixed up in anything dodgy. Calypso has to make some hard decisions about reconciling Aboriginal family obligations and his own future. Jared Thomas has a light touch, but non-indigenous readers will have to face up to some hard realities too. I don’t want to live in a country where young people of Aboriginal are discriminated against in the job market, and I feel very uncomfortable when I see that Calypso realises that when he goes to meet Clare’s family for once he didn’t need to worry about the colour of his skin with Clare’s dad being Aboriginal. Learning that Calypso’s mother has never been able to afford a car in a country where almost everyone has one, is an embarrassment. Reading about the harassment of a couple of racist ‘cowboys’ makes me angry. A book like this brings the reader into the everyday reality of indigenous people, and that makes it very powerful indeed. This would make a great book for Year 11 or 12 reading lists. I read this book for 2014 Indigenous Literature Week, but I would have enjoyed it any time. If you haven’t already signed up for 2014 ILW, here’s the link! PS That stunning cover design is by Tracey Gibbs from Perth. Dr Jared Thomas is a Nukunu man from the Southern Flinders Ranges. and from all good bookstores. I saw this somewhere recently, and know my library has a copy, but hadn’t seen a review til now. It sounds great. Yet another to add to the TBR. It’s a quick and easy read, Louise, though that doesn’t mean it’s lightweight. Calypso Summer has just been added to my holiday reading list. I have a big pile of reading to be done, from purchases from Magabala books throughout out the year that I save up for winter reading and that starts on the first day of the holidays!! It definitely sounds better than Stolen which was my set Year 12 text about indigenous people. Hello LeadingLight – I like your moniker! I don’t think I know that title, and my Google search didn’t help because there are so many sites about the Stolen Generations. Thank you. I researched a bit and found it. It is Stolen by Insight Publications. The author is Jane Harrison, I think. Thanks, I’ve found it now at Wikipedia. I see from Harrison’s entry at Wikipedia that she is also the author of two novels, the most recent one of which is a YA novel called Becoming Kirrali Lewis, which won the Black&Write award for 2014 and is due for publication next year. I’ll look out for it. I think it’s important for all Australians to know about the wrongs done to our indigenous people, and my guess is that setting the play for Y12 was a well-meant attempt to help young people identify with the feelings that still hurt as well as the effects that still resonate. But studying any play – even Shakespeare – at Y12 level – can kill it. Plays IMO are not like novels, they need to be seen, heard, felt and shared with the rustle of an audience around you. They need to be talked about, yes, but because they reach to the heart as well as the head in that unique way, I find them hard to write about. I recently went to Patrick White’s play Night on Bald Mountain, but I couldn’t write about it here – I admire reviewers of theatre more than anything else because it’s so hard to do, and doing it badly can kill the play. There’s no way I could write a Y12 essay about it! Beautiful review, Lisa! I will add ‘Calypso Summer’ to my wishlist. I love the way the book describes Calypso’s life and the unique challenges he faces. Is there a little bit of cricket in the novel? *chuckle* Yes, there is a little bit of cricket in it!